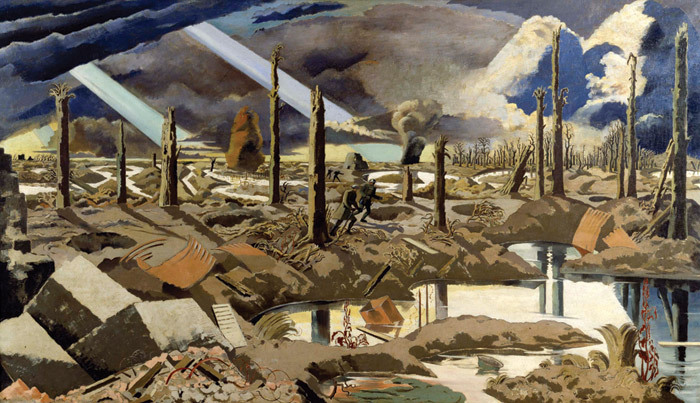 Tate Britain’s retrospective of the work of war artist Paul Nash provides a fascinating walk through his psyche, says Herbert Wright. We see him standing in a big coat in a short 1940 film, intense eyes flicking from sketchbook to a field of Luftwaffe wreckage gathered in Oxfordshire. This is Paul Nash, Britain’s only official war artist in both world wars, and England’s home-grown surrealist. From the start, those eyes seemed to see things that others didn’t — an otherness in objects, landscapes, the sea and the sky. Tate’s retrospective (far deeper than the Dulwich Picture Gallery’s of 2010) is like a walk through his psyche, and it’s a fascinating walk. Nash sensed a metaphysical world. For him, inanimate objects could be ‘personages’, and ancient mystical forces permeated the English countryside. From the start, he was besotted by it. Trees were often the stars of his pictures, characters in their own right. Some were as transparent as jellyfish, others solid, brooding. 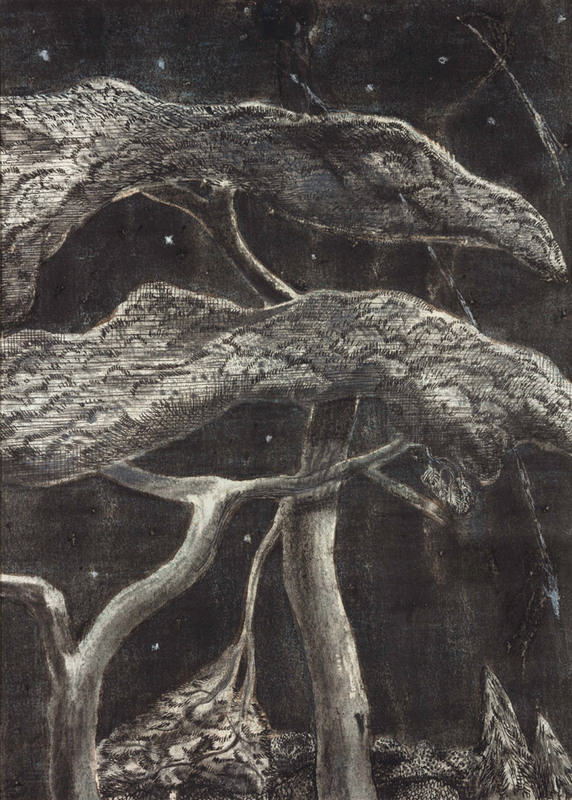 A tree canopy in The Falling Stars (1912) actually becomes a sinister bird’s head. Nash did not find himself in the First World War’s trenches until early 1917, and initially still saw nature — in Spring in the Trenches, Ridge Wood, he shows new growths emerging. He avoided Passchendaele because a non-combat accident had him sent home. When he returned, the reality of war soon obliterated earlier tender visions, as it obliterated men and nature. He described what he called an ‘unspeakable, godless, hopeless’ world. His work became a message against warmongers and ‘their lousy souls’. In this war, only vorticist CRW Nevinson brings as new a way of seeing it. In Nash’s The Ypres Salient at Night (1918), flares illuminate a landscape of trenches — barren, man-made, stark. The Menin Road, perhaps his most powerful canvas and 3m wide, is a vista of water-filled shell craters, churned earth, a sky of doom and drama, a few soldiers moving between trees stripped to stumps. (In scale and composition it forward-echoes Max Ernst’s 1942 anti-war masterpiece, Europe After the Rain). Back in England, the darkness lingered — his Winter Sea (started in Dymchurch, Kent, 1925) is as cold and steely as a theatre of war, but more constant. But Nash was also diversifying into different media — woodwork, photography, writing — and his interests were evolving. He worked with found objects and photographed things he saw strangeness in, such as a dead tree he called Monster. Neolithic stones in Wiltshire became obsessive subjects. By the mid-Thirties Nash was riding the crest of a wave breaking in new artistic territories. He was central in the modernist-surrealist collective Unit One, which included the likes of Hepworth, Ben Nicholson and Isokon’s architect Wells Coates. In 1936 he helped organise the International Surrealist Exhibition in London, where crowds surged to see work by Ernst, Dalí, Miró and others. 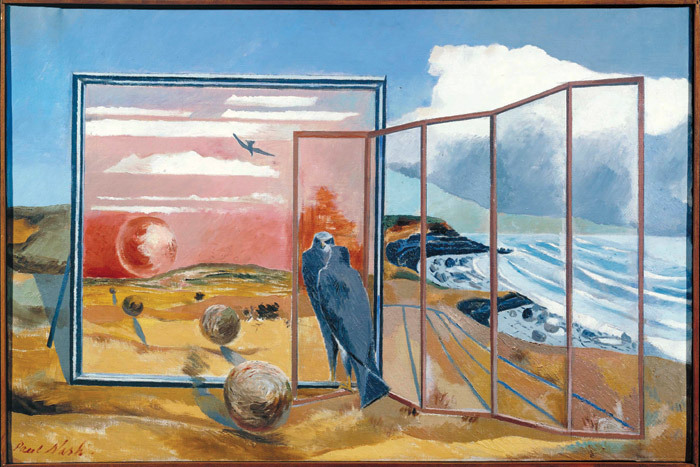 Nash’s own surrealism was influenced by Giorgio de Chirico more than any, but Alberto Giacometti inspired a sculptural work called Aviary, a frame structure with abstracted birds. After being lost for 70 years, the Tate found it and shows it — sadly without the original handheld blue viewing glass. His most famous surrealist work, Landscape from a Dream, returns us to the English countryside. A falcon stares into a mirror by a cliffedge, and sees into an inner space where its soul seems to be on wing in a sunset. This extraordinary vision stands among the best of European surrealism. When another war broke, the enemy came from the air, as in one of Nash’s earliest works, The Combat (1910), in which a devil swoops down. In 1941, he painted a great composition of plane trails, the Battle of Britain, sadly missing from this show, but we do see the masterpiece of Luftwaffe wreckage he had surveyed, Totes Meer, from the same year, and a very different work that took him in a new direction, the semi-abstract Battle of Germany (1944). His most beautiful, peaceful paintings also came from this time. The Wittenham Clumps in Oxfordshire, hills crowned by trees, had been a subject ever since 1911. In the Forties the sun and moon connect them to the cosmos in canvases like his Vernal Equinox landscapes. In Cumulus Head and Flight of the Magnolia, he has already left the Earth to be in forms emerging in clouds. There is something heavenly about them, the ultimate strange wonder revealed to Nash. He died in 1946. War made Nash a towering modernist artist, but he remained a romantic. The deeper worlds he sensed in what he saw are a lesson for now, when the overload of media imagery makes even the real world hard to see.